1.Gelatin fill with water and let it swell for him. 2.Starch diluted in a little water. 3.Apples peel, remove the core and grate on a coarse grater. 4.Apples to put in the pot to fill them 5.Bring to a boil over high heat, then to reduce fire and simmer stirring for 30-40 minutes. 6.Add the dissolved potato starch and all mix thoroughly. Bring to a boil. 7.Hot applesauce blend or grind through a sieve. 8.Gelatin heat until complete dissolution of the grains. Pour in applesauce and mix thoroughly. 9.Take any shape to shoot it with paper or cling film and fill with Apple mixture. 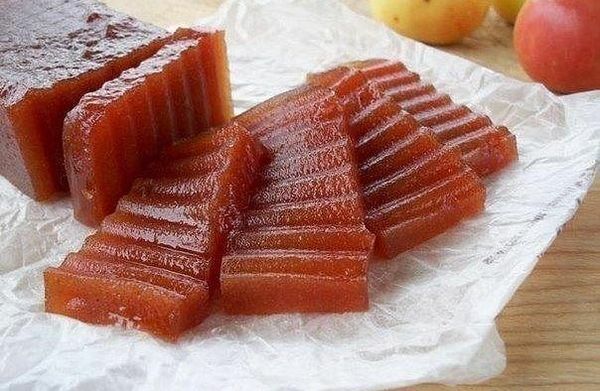 To level and put the marmalade in the refrigerator until fully cured. 10.Then remove from the mold and cut into pieces. Optionally, you can garnish with nuts, dried apricots, raisins or prunes.